Today we have launched a Brand New, Limited Edition, Kente Honey Blouse. The Peplum Clergy Blouse has been a favourite amongst our Clients and it keeps getting better. The first change was a dropped back (giving our ladies more coverage). Now we’ve changed the Peplum Fabric to a Traditional African Kente Print. What will we do next… (check back in coming weeks to see – this Designer is on a roll). 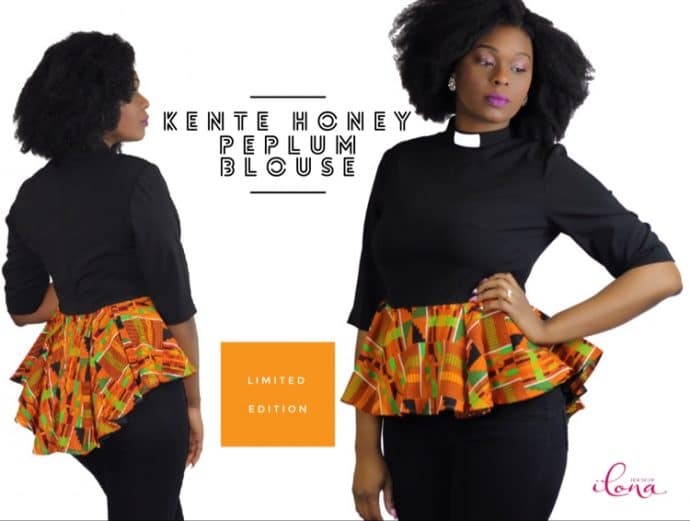 One of our precious clients, based in LA will be ministering in Paris, London and Ghana next month, so this Kente Honey Clergy Peplum Blouse will be perfect for trip, it travels will and is deigned to work in various climates. This product is no longer available. Leave a comment below if you would be interested in something similar. This entry was posted in Blog and tagged @houseofilona, african print clergy blouse shirt.